I’ve been kissed by a man! Eeek!! It was my first time ever, and most probably won’t happen again (sorry to disappoint). Of course, my kisser wasn’t any random man, but more on that later – first things first. I have been following Jackie Leven’s outputs since his first ‘proper’ solo album, i.e. under his name, more than 15 years ago, and I went to a few concerts, one of the most memorable being 2008 in a wild-west-style pub in Leytonstone, Far East London, which I must write up at some point, because it was so utterly bizarre. Jackie Leven himself hints at the bizarreness in the first three paragraphs of his June 2008 blog entry. Tonight’s gig was at the Slaughtered Lamb in Clerkenwell, and frankly, I cannot possibly conceive how this pub has managed to elude my radar. Not because it is the most atmospheric pub in the universe, even though it is quite inviting, relaxing and nice. But the competition for the best pub in Clerkenwell is high, so to stand out, a venue must have an additional attraction. 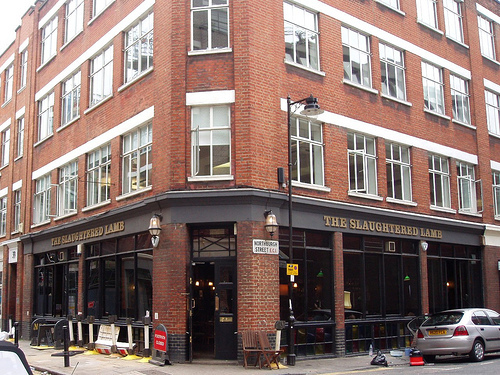 The attraction of the Slaughtered Lamb is the gig room in the basement. The attraction of this intimate downstairs room is certainly not based upon its interior design, which is dark and pub-ish. No, what stands out is the gig list: this venue hosts a number of really good musicians! This is the venue of the Electroacoustic Club, and the nights when the Club does not use the room are filled with equally interesting gigs. Always worth keeping an eye on. So how was Jackie Leven? Brilliant, of course. This time with a full band, which is almost a bit unusual. The show, however, was the usual mix of Jackie’s songs that sometimes seem so simple, but rapidly gain depth by how they are performed. And of course Jackie told his brilliant stories in between the songs, as always with a generous portion of wry Scottish humour. To get a glimpse of these, head over to Helpless Dancer, who obviously has been at the same concert. Jackie Leven, the Scottish troubadour. No need for me to add anything. And what about that kiss? Well, it wasn’t a real kiss, just a peck on the cheek (phew…) by nobody other than Jackie Leven himself! I asked him on behalf of my friend for an autograph on the new Gothic Road CD cover, and after a short chat and a massive mis-spelling of the recipient’s name (ah well, doesn’t really matter, does it?) he said, “give her a kiss from me”, leaned over, and pecked me on the cheek. Not awkward at all in that moment, just a little…unusual…afterwards, but overall just another interesting story to tell. And, needless to mention, I passed the kiss on without hesitation. Thanks, Jackie, I guess.